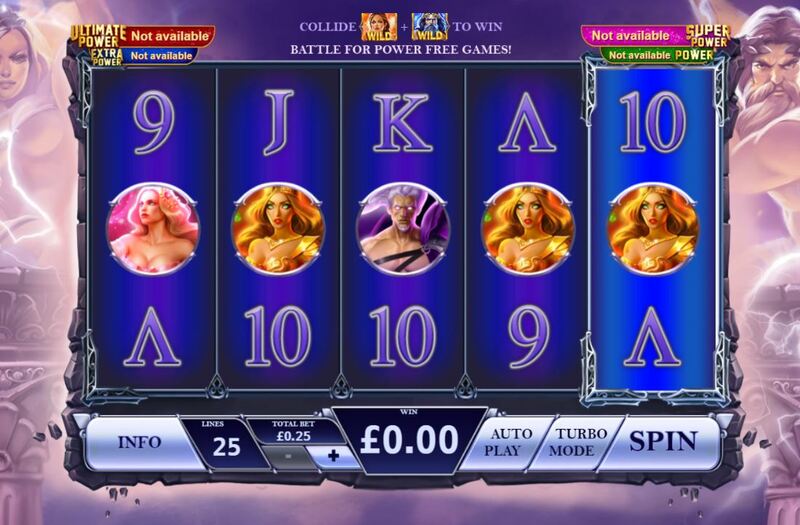 Age of The Gods Rulers of Olympus slot is the latest in a series entitled Age of The Gods. The AOTG series is a combination of the old Marvel licensed games such as Iron Man 2 and Fantastic 4 which had to be reworked with this new theme when the Marvel licence expired, plus newly designed slots added to the range. Rulers of Olympus comes hot on the heels of Mighty Midas and Medusa and Monsters as the third new mechanic in this range so of course uses the same subject of Ancient Greek Mythology. We see statues of the Gods at the side of the grid surrounded by lightning with equally powerful classical music as we spin, punctuated by sounds of their might when wins appear. Initial indications are that we could be in for a real battle to leave here with our bankroll intact! Rulers Of Olympus gives us 25 fixed pay lines over a grid of 5 reels and 3 rows. There are the Gods depicted in circular mirrors as the premium symbols and card values for the rest. The Gods appear singly and the card values stacked in pairs, with the Standard Wild, Hera Wild, Zeus Wild and Orange Goddess all paying 40x our 25 coin stake for 5-of-a-kind. The Green God is 10x, Purple 8x and Pink Goddess 6x alongside six card values paying from 2x down to 1x. You will only see a Bonus or Olympus scatter appearing on reel 5, but for now I'm sure you're wondering why we have three different Wilds here. Hera Wild only appears on reel 5 and Zeus Wild on reel 1. When they do, they migrate left and right respectively along the row they landed on, one reel at a time over the next spins until they disappear off the edge. You may have seen this before if you've played Netent's Invisible Man slot. If you have, you'll know that more Shifting Wilds can appear on the grid during this and that if these two Shifting Wilds clash by being on the same row, you'll reap some kind of reward. In this instance you will get a series of free games called the Battle for Power in which Hera and Zeus clash, each time creating a splash of extra Wilds on the grid for that spin. These games continue until Zeus is defeated by Hera. Quite a simple one - see the Bonus Lightning tile land on reel 5, lightning will then create up to 7 extra Wilds on your grid. 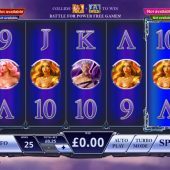 If the Olympus tile lands on reel 5 you will be awarded 7 free spins. These can retrigger indefinitely too. The enhancement applied for the duration is the creation of a 4th. row on the grid and the doubling of your pay lines to 50. You will also see up to 10 Zeus or Hera Wilds lock on to the grid for each free spin. This is where the biggest rewards can be reaped from your time in Olympus.